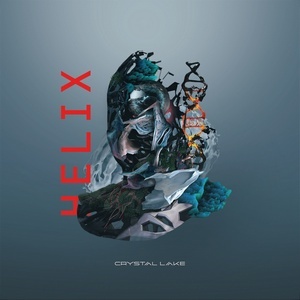 Making a bit of a name for themselves within the metalcore scene in more recent years, Japanese act Crystal Lake’s most recent album Helix has been out in their own country since 2018 but caught the ears of Sharptone Records, who are giving it a proper Stateside release. But does it have the appeal to be brought to a larger audience? The answer to that question is unfortunately a solid maybe. Some of the opening tracks on Helix are fantastic stuff for the genre. “Aeon” and “Agony” set the tone for a vicious and frenetic take on the genre (not to mention modern with the electronic use), and one that still manages to feel fresh so many years in. Even with “Agony” having some cleaner vocal use, it’s an energetic and monstrous track. But after the strong lead-in, things seem disjointed at best. The band swerves between more melodic fare, which does work even if it feels a bit clichéd and formulaic (“Lost in Forever”) and some rap/metal hybridization that utterly fails. “Outgrow” feels a bit more Linkin Park-like than anything else, but it’s not the worst of the bunch here – the honor goes to “Just Confused,” which uses some cringy industrial backing to accompany some spoken word/rap verses and feels completely out of place on the release. The final tracks “Apollo” and “Sanctuary” leave things on a slightly stronger note, but the damage has already been done by the middle of the disc. Helix is nothing if not disjointed. Some might argue variety, but it shouldn’t come at the expense of the flow of an album. Crystal Lake have some moments of potential bookending the release, but the more more clichéd melodic moments and awkward rapping all but destroy any momentum they attempt to generate.